“Campbell is a very extensive dealer in cattle, and has often occasion to send great droves into Northumberland; and, when driving such a trade, he would be a great fool to embroil himself with our Northumbrian thieves”. In Rob Roy Francis Osbaldistone is the son of a rich London merchant, whose father summons him to return from Bordeaux. However, Frank declines an invitation to enter the family business, and he is banished to Osbaldistone Hall, the Northumberland home of the head of the clan, Sir Hildebrand Osbaldistone and his six sons. Illustrations in early editions of the novel are almost unanimous in suggesting that Osbaldistone Hall was Chillingham Castle. Skene, who investigated the scenery in the Waverley Novels, does not mention it, but in The Country of Sir Walter Scott  Charles S Olcott brooks no alternative to Chillingham. This view also appears to be held by William Mathie Parker, the eminent literary topographer, in his preface to the Everyman edition of 1962. In a long note to the 1914 Oxford edition of Rob Roy, C.B.Wheeler argues the case for Biddlestone. His arguments are credible, but not conclusive. He begins by pointing out that Frank must diverge from the Great North Road to reach Osbaldistone Hall, and that the turn for Chillingham at Alnwick is too far from Darlington. It would probably be just as difficult to reach Biddlestone as to reach Chillingham. However, Scott has Campbell say that he has business in Rothbury which makes Biddlestone more likely. The key phrase here is “the Middle Marches” which is the name given to the border between England and Scotland between the Cheviot and Peel Fell, including the head of Coquetdale and Carter Bar. The way from Chillingham into Scotland would be by the Eastern Marches. Biddlestone Hall was for long the seat of the Selbys who were granted the estate by Edward I. It was a pele tower, which was later extended so that there was a small courtyard. The Selbys, like the Osbaldistones, were Catholics and, very likely, Jacobites. One indication that the Selbys may have been the model for the Osbaldistones is that when Scott knew Biddlestone Thomas Selby had a family consisting of seven sons which is reminiscent of the six Osbaldistones, and, two generations earlier, Ephraim Selby who, together with his steward, joined the real rising at Plainfield outside Rothbury in 1715 had five brothers. What is not known is if or when Scott visited Biddlestone, but it may have been when he was in the Cheviots in 1791. Scott spent his twentieth birthday at Langleeford six miles from Wooler with his uncle, Robert Scott. In a letter to William Clerk he wrote “…. Flodden, Otterburn, Chevy Chase, Ford, Coupland Chillingham and many another scene of blood are within a forenoon’s ride.” It is this reference which has persuaded editors that Chillingham may well have been “Osbaldistone Hall”, but Scott could equally well have visited Biddlestone en route to Otterburn, or at the beginning of this trip when he entered Northumberland by ‘a pass in the Cheviots’. There is a local tradition that he visited the Rose and Thistle in Alwinton. 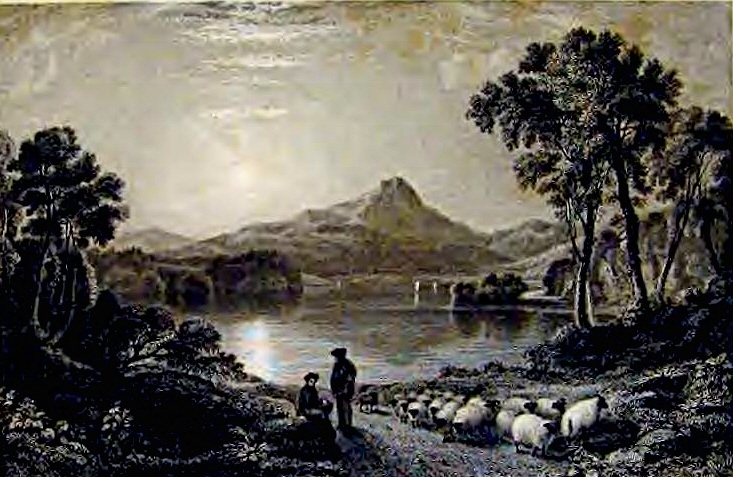 Scott also traversed Northumberland when he visited Hexham in 1792. There is further evidence in a letter which Scott wrote to Robert Surtees (1779-1834) in which he thanks him for sending ‘anecdotes of the Selbys’. It was Surtees who played a trick on Scott by sending him a Border ballad, which he, Surtees, had composed himself, which was subsequently published in the Minstrelsy of the Scottish Border. However, there is no reason to suppose that Surtees, a distinguished antiquarian, who later regretted his practical joke, supplied Scott with false information about Biddlestone. It suggests an important connection between Scott and Coquetdale. Incidentally Surtees was also the author of “Lord Derwentwater’s Farewell”, said to have been written by Derwentwater, the most famous Northumbrian Jacobite, on the eve of his execution. James Hogg published it in his Relics of Jacobite Poetry. A further curiosity in the neighbourhood is the occurrence of a Rob Roy’s Cave at Holystone. No one locally seems to be quite sure how it got its name. Perhaps it was from the veritable Rob Roy who must have traversed the district as a cattle dealer following one of the several drove roads, which traverse the county. 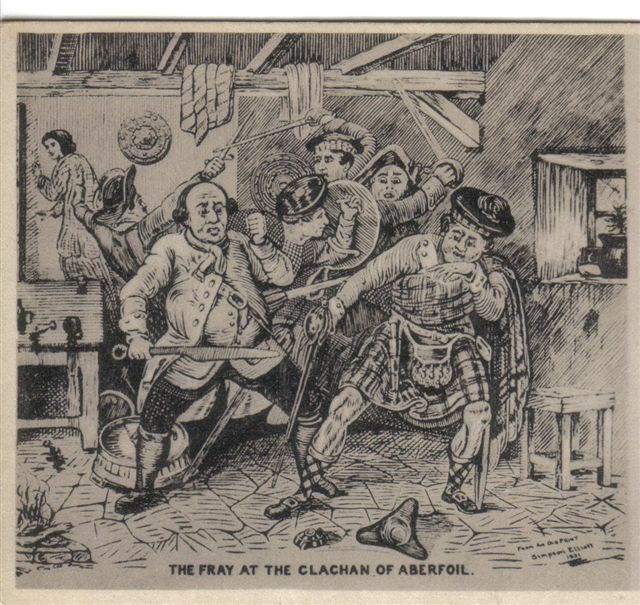 However, it is unlikely that the real Rob Roy would have found it necessary to hide in Northumberland, or that he would have been well enough known there to give his name to a cave. It is rather more likely that it was the novel that gave rise to the name – just the kind of label that the Victorians would attach to this rather inaccessible cave. There are, indeed, two passages in the novel where Rob Roy hangs about in the vicinity of Rothbury. The landscape of Northumberland may be less well known than the scenery about Aberfoyle but it adds considerable interest to Rob Roy. 1. “In addition to re-creating its character in 1715 on the eve of the first Jacobite rebellion, [Scott] also dashed off a lengthy introduction to Border Antiquities (written in 1817) in which he vividly dramatises the earlier history of the lawless Middle Marches through which Frank and Andrew Fairservice take flight along moorland tracks known only to smugglers; latter day degenerate descendants of the Border Reivers of Tudor Times.